Since 2002, the FEAC® Institute has been training, educating and certifying Enterprise Architects in the practice of Enterprise Architecture and critical-thinking skills all around the globe. Over the years, we have certified thousands of Enterprise Architects in Information Technology and various Enterprise Architecture frameworks and methodologies like FEAF, DoDAF, TOGAF and more. Countless FEAC graduates have gone on to high-level Government positions and executive-level private sector positions upon earning their CEA™ (Black Belt) or ACEA™ (Green Belt) designations. Only FEAC offers these designations with a world-class faculty of practitioners who are Enterprise Architects in the real world, and which has included current and former US Federal Chief Enterprise Architects. You can take your career to the next level with our world-class Enterprise Architecture Short Education Courses or even earn the coveted CEA (Certified Enterprise Architect) Black Belt, or ACEA (Associate Certified Enterprise Architect) Green Belt certifications in Enterprise Architecture. Whether you are brand new to EA, or a IT seasoned professional, our courses will broaden your understanding of Enterprise Architecture and modeling and give you the ultimate foundation to make yourself valuable in today's market. Any education or certification in Enterprise Architecture needs to be grounded in both frameworks (i.e. Ontologies) and methodologies. Our short education courses in Enterprise Architecture are offered self-paced, totally online and will give students broad exposure to the Enterprise Ontology (The Zachman Framework) and a range of framework and methodology choices with specialization in the Department of Defense Architecture Framework (DODAF) and the Federal Enterprise Architecture Framework (FEAF). Each of these Enterprise Architecture Frameworks have proven to have immediate applicability and impact in the private sector as well as the Federal space. The FEAC™ Institute understands the various needs of organzations today, whether government or private sector, and can help you build the skills needed to succeed in your Enterprise Architecture program, project, career or community. 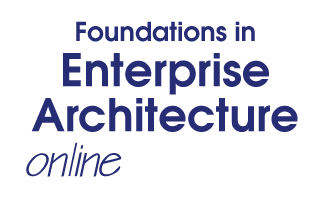 Introduction to Enterprise Architecture: This self-guided course is targeted at those individuals looking to understand what Enterprise Architecture is and how it can be used to manage complexity and change in an organization. The course, comprised of seven video lectures, provides an explanation of Enterprise Architecture (EA) frameworks as well as introduction of popular frameworks such as the Federal Enterprise Architecture Framework (FEAF) and the Department of Defense Architecture Framework (DoDAF). Participants will also explore the importance of culture and how EA can be used to address an organization's value as a part of planning efforts. Students are expected to complete a short set of assignments and knowledge assessments to help reinforce learning objectives. What participants receive: 90 days access to the FEAC Virtual University which includes the narrated video lectures. Students also receive copies of the presentations that they may download for their personal use. Upon completion of assignments and successful completion of the knowledge assessment, students will receive a certificate of completion worth 10 EADUs (Enterprise Architecture Development Units). Students may also contact their faculty advisor during their 90 days of participating to ask EA related professional questions. Once you register: Once students have completed registration and payment is processed they will receive notification and access to the FEAC Institute Virtual University (VU) within 1 business day. Students will have 90 days from the day of VU notification to complete the course and a suggested schedule of activities is provided but students are free to complete the course in any order or pace they desire. 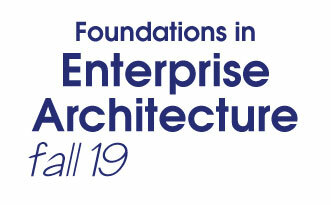 Foundations in Enterprise Architecture Bootcamp: Building on the material from the Introduction to Enterprise Architecture online course, this self-guided course contains video lectures discussing planning for EA; considerations when creating EA models; as well as an introduction to the development of a minimum set of descriptive models in addition to the video lectures contained in the Introduction to Enterprise Architecture Course. Participants will complete assignments on what to consider when selecting EA views; evaluating models from Industry as well as completing a small Integrated Architecture Description (IAD) and small practicum project by building models and begin to see how EA analysis addresses enterprise issues. What participants receive: 90 days access to the FEAC Virtual University which includes 10 video lectures. Students also receive copies of the presentation materials as well as access to a and access to a downloadable reference library. Upon completion of the video lectures and assignments students will complete a short knowledge assessment allowing them to receive a certificate of completion worth 20 EADUs (Enterprise Architecture Development Units). Students will also have the opportunity to discuss their progress and efforts with their faculty advisor. Applicants must possess the ability to undertake college-level study. A general knowledge of business, program or IT planning and conceptual thinking abilities are desirable. Each course within these programs offers separate assignments and exams, but they are taught in relative consecutive order. Courses are often taken while students hold full-time jobs. Each of these courses are conducted at the student's pace, totally online in the FEAC Virtual University. 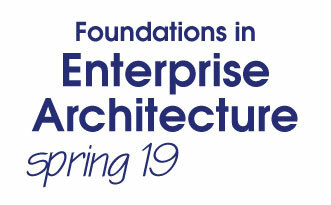 We also offer our Foundations in Enterprise Architecture course in a live format as well (see above).